Below are the official 2018 Hockomock League Boys Basketball All Stars, selected by the coaches in the league. FOXBORO, Mass. – For nearly nine minutes in the second half, Foxboro’s offense was stifled by Canton’s 1-3-1 zone defense. It was just the latest move in a chess game between the Warriors and the Bulldogs. During that span, Canton cut the 10-point deficit down to just three, 29-26, with five minutes to play. Out of a timeout, Foxboro responded with its move, adjusting its offense to get the ball into the post. The adjustment resulted in a 6-0 spurt over a two-minute span, helping the Warriors hold on for a 39-34 win over the Bulldogs, putting the teams into a first-place tie atop the Davenport division with just one game left. “What you saw tonight was two evenly matched teams and two teams that were very well prepared for each other,” said Foxboro head coach Jon Gibbs. “Once you get to this point in the season, teams know each other so well and they’re going to take away what teams want to do. I thought you saw two teams tonight that played really well on defense and took away some of the top options on both sides. I’m just really proud of our guys the way we came out defensively with such energy. Over its scoreless span, the Warriors tried to shoot out of the zone but went 0-for-9 from three-point range, 0-for-1 from two-point range and had one turnover. But out of the timeout with five minutes to go, Gibbs had the offense focus on getting the ball inside. Matt Rongione (eight rebounds, five assists) executed the game plan, finding Borde (seven points, four rebounds) on the baseline with a bounce pass for an easy two. On the next trip up, Rongione hooked up with Borde once again down low for another two. Canton came out of the zone and Borde was able to track down a miss, leading to two free throws from Anthony Mollica, giving Foxboro a 35-26 lead. “We definitely knew the 1-3-1 was a possibility so we spent some time over the past two days and had a couple of different packages,” Gibbs said. “Early on we were taking a lot of jumpers, and I thought they were good looks, but unfortunately none of them were going in. So at some point, you have to make an adjustment so we went with another look that got us some more paint touches and we were able to get free down low for a couple of layups and that forced them to come out of it. Canton made one more push as Foster (13 points) drilled a three with two minutes to go and Austin Maffie converted a putback with 1:25 to go, bringing the deficit to four at 35-31. But Borde hit a free throw on the other end, Canton had a three rim out, and Rongione came down with the defensive board. Bobby Harrison (eight points) hit three of four free throw attempts in the final minute to ice the game. Foxboro created its largest lead between the end of the second and early in the third. Harrison drove to the basket for two, Morrison (14 points) drained a three on a feed from Rongione, and Rongione converted at the rim himself to give Foxboro a 22-15 lead. To start the third, Rongione hit a free throw, Borde hulled in an offensive rebound for put it back in for two, Morrison scored after a steal from Teddy Maher, and then Maher scored again after another steal of his own to make it 29-19. Canton then made the switch to the zone, which afforded its offense some time to get back into the game. Foster scored on a feed from Verille off an inbounds play and Foster hit two free-throws to get within five (29-24) at the end of three. Harris (nine points, eight rebounds) scored in transition on a pass from Foster to make it a one-possession game with 6:25 to play. It took over three minutes for the teams to open the scoring in the first quarter. Foxboro led by as much as five on a Maher three, but Canton outscored the hosts 7-2 over the final two minutes, including a coast-to-coast layup by Harris at the buzzer to put the Dogs ahead, 11-10. Foxboro boys basketball (11-4 Hockomock, 15-4 overall) pulls into a tie atop the Davenport alongside Canton with the win. The Warriors have a chance to win at least a share of the division title if they can beat North Attleboro on Friday. Canton (11-4, 15-4) is in the same boat and will have another shot at winning the division when it hosts Stoughton on the same day. Canton, 74 vs. Archbishop Williams, 45 – Final – Canton allowed just five points in the third quarter, turning an 11-point advantage (34-23) at halftime into a comfortable 52-28 lead. Senior Tony Harris had a team-high 16 points, junior Devin Foster added 15 points and senior Austin Maffie chipped in with nine points. Sharon, 61 vs. Norwood, 45 – Final – Sharon sophomore Aidan Kane paced the Eagles with a career-high 16 points while senior Malik Lorquet added nine points. 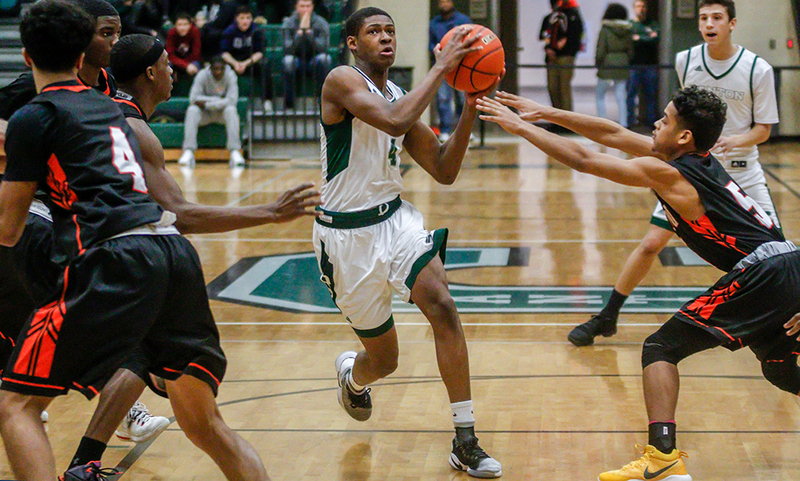 Sharon, 58 @ Canton, 86 – Final – Canton senior Tony Harris poured in 26 of his 33 points in the first half and junior Devin Foster finished with 26 points as the Bulldogs picked up a big win over Sharon. Sharon sophomore Aidan Kane had a career-high 14 points for the Eagles. Foxboro, 51 @ Milford, 59 – Final – Foxboro raced out to a 9-0 but Milford stormed back to take a slim lead after one. Foxboro regained its advantage at halftime (33-28) but the Hawks struck back, outscoring the Warriors 15-6 in the third to lead 43-39. Kayden Kelley (10 rebounds), Andrew Fraioli (11 rebounds) and Brendan White all had 15 points apiece for Milford. Joe Morrison led the Warriors with a career-high 28 points. Franklin, 47 @ Mansfield, 59 – Final – Click here for a recap of this game. Stoughton, 51 @ North Attleboro, 42 – Final – Stoughton had a strong opening quarter and used the lead it created in the period to beat North. The Knights outscored the Rocketeers 17-8 in the opening quarter, the teams both combined for 34 points each over the next three quarters. Stoughton’s Cam Andrews led all scorers with 22 points while junior Owen Nassaney had 13 points for North. Attleboro, 41 @ Oliver Ames, 52 – Final – Oliver Ames’ Kayla Raymond scored 30 points, hitting the 1,000 point mark for her career in the win. Raymond, who is the ninth female player in OA history to reach the milestone, also had 11 rebounds and four steals. Check out the video below. Canton, 53 @ Sharon, 36 – Final – The Bulldogs moved within one game of clinching a playoff berth with the road win against the Eagles. Hannah Jerrier once again paced Canton with a double-double of 22 points and 12 rebounds, while Erin Devine chipped in with 12 points, eight rebounds, and six blocks. Emma Eberhardt led the Eagles with 14 and Evanjuline Elisma added seven. Milford, 26 @ Foxboro, 80 – Final – Ashley Sampson led the Warriors with 21 points, while Lily Sykes and Shannon Smally each added 10 for Foxboro, which continued its unbeaten run through the league. All 10 players scored for the Warriors. Mansfield, 62 @ Franklin, 48 – Final – Click here for a Recap and Photo Gallery from this game. North Attleboro, 46 @ Stoughton, 57 – Final – Stoughton bounced back from its loss to Stoughton behind Val Whalen’s 19 points and 16 rebounds, her second double-double against the Rocketeers this season, and 17 points from Aliyah Wright. With the win, the Black Knights get back to .500 on the season. Canton, 44 @ Milford, 45 – Final – Milford junior Brendan White hit a three with 0.4 seconds left while being fouled, elevating the Hawks to a win after a wild final minute. Milford had a 42-40 lead with under 30 seconds to play and even got a stop but a jump ball gave Canton the ball back. Devin Foster (17 points) hit three free throws after being fouled to take a 43-42 lead, and after a Milford turnover, Foster hit another free throw to give the Dogs a 44-42 lead. But White took a pass from Kayden Kelley (10 points, 10 rebounds) and hit the winning shot while being fouled. Andrew Fraioli added 11 points and 12 rebounds for Milford while Tony Harris had 16 points for Canton. 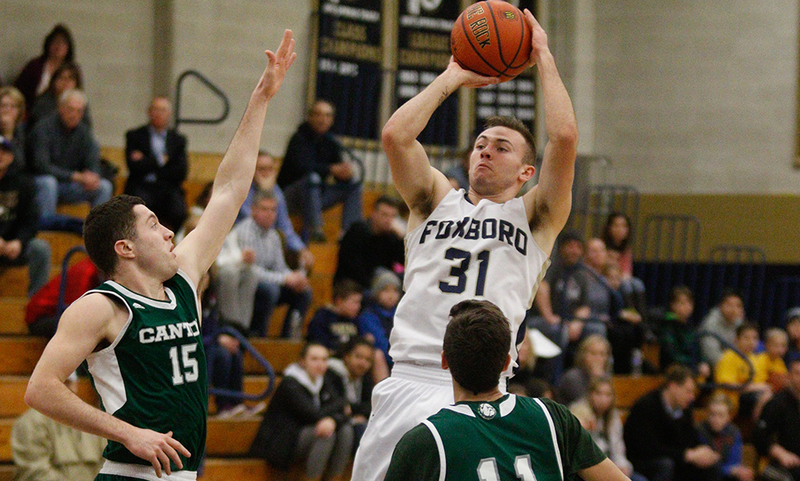 Foxboro, 59 @ Stoughton, 53 – Final – Foxboro hit six three-pointers in a 30-point third quarter, turning a 32-16 deficit at halftime into a 46-46 tie heading into the fourth quarter. Bobby Harrison scored five of his team-high 15 points in the fourth quarter while Joe Morrison added 12 points and Matt Rongione had 11 points, including three triples in the third. Anthony Mollica added five of his eight points in the fourth quarter for Foxboro. Stoughton senior Cam Andrews had a team-high 18 points while senior Steevens Phelimond had a career-high 16 points for the Knights. Franklin, 63 @ Taunton, 51 – Final – Click here for a recap of this game. Sharon, 45 @ North Attleboro, 58 – Final – North Attleboro senior Chad Peterson returned from injury and scored a career-high 23 points, draining seven three-pointers to lead the Rocketeers to a win over Sharon. Peterson hit four triples in the opening quarter, two more in the second and another in the fourth. North led 34-27 at halftime and 43-38 at the end of three. The Rocketeers clinched the game with a 15-7 fourth quarter. Josh Montague added 11 points for Big Red while Jacob Petersen finished with eight points. Sharon’s Malik Lorquet had 19 points, 10 rebounds, and nine blocks while Alex Kaufmann added 14 points. Mansfield, 58 @ Attleboro, 40 – Final – Meg Hill had her 12th double-double of the season with 21 points and 12 rebounds and she also added four blocks. Hill is now seven points shy of 1,000 for her career. Ann Maher and Sydney Mulkern each added nine points for the Hornets. Sam Pierce paced Attleboro with 11 points and Liv McCall added eight. Stoughton, 19 @ Foxboro, 74 – Final – Foxboro went on a 17-0 run after the opening basket by Stoughton to take control and added a 10-0 run to close out the first half. Ashley Sampson was the game’s top scorer with 18 points, while Grace Tamulionis added 16 points and 10 rebounds for the Warriors. Foxboro also got 12 points from Lily Sykes and nine points from Abby Hassman. Val Whalen led the Black Knights with six. King Philip, 45 @ Oliver Ames, 61 – Final – Oliver Ames senior Kayla Raymond continued her stellar play this season, scoring 31 points and hauling in 10 rebounds to led the Tigers to a win at home. Alex Sheldon added nine points and 14 rebounds while Erin Holmberg chipped in with eight points. Attleboro, 73 @ King Philip, 65 – Final – Attleboro sophomore Bryant Ciccio scored 15 of his team-high 18 points in the second half, helping the Bombardiers storm past King Philip. The Warriors built a 20-point lead in the second quarter, but an 11-2 run from Attleboro made it a 10-point game at halftime (31-21). Ciccio and Dom Victor each scored six points in the third period, helping Big Blue outscore KP 25-10 in the period, including a three from Victor at the buzzer. Qualeem Charles added 11 points and 16 rebounds, Kevin Velazquez added 11 points off the bench, Nate Douglas chipped in with eight points while Mason Houle and Elvin Sam each finished with seven points, including key second-half triples. King Philip senior Pharoah Davis scored a career-high 23 points for the Warriors. North Attleboro, 39 @ Canton, 58 – Final – Canton senior Tony Harris tied a program record with a career-high 36 points to lead the Bulldogs to a win over visiting North Attleboro. The Dogs built a 14-11 lead in the first quarter and then took a 35-21 lead into the halftime break. Harris hit seven three-pointers in the game, Austin Maffie had nine points and junior Devin Foster dished out 14 assists. Josh Montague had a team-high 12 points while junior Jake Petersen added nine points for Big Red. 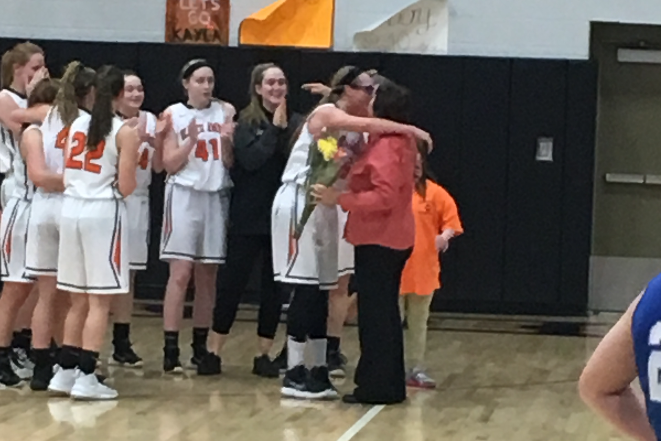 Sharon, 54 @ Foxboro, 63 – Final – Sharon led 19-11 after one, and took a 26-25 lead into the half but the Warriors outscored the Eagles 21-6 in the third quarter to seize control of the game. Junior Anthony Mollica scored 12 of his career-high 18 points in the first half and Matt Rongione dropped eight of his 11-points in the third quarter to help the Warriors. Sophomore Brandon Borde added 11 points for the Warriors. Sharon’s Alex Kaufmann had a team-high 18 points. 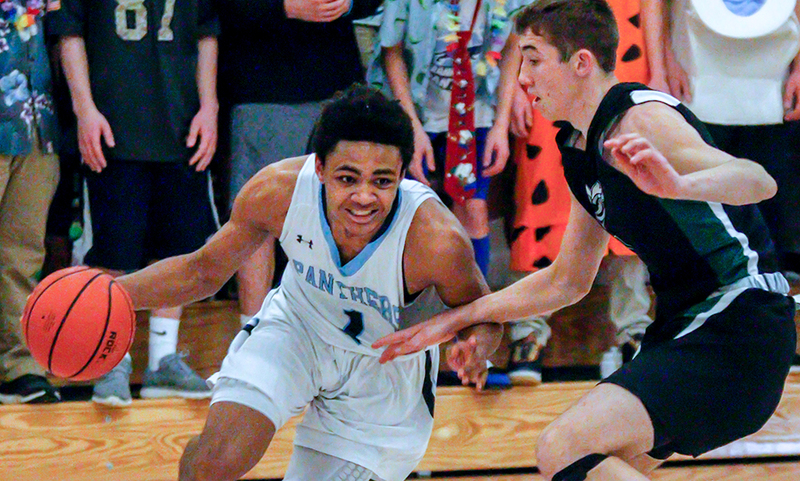 Oliver Ames, 36 @ Franklin, 70 – Final – Franklin was in control from the beginning with sophomore Chris Edgehill scoring a team-high 24 points in the win. Mansfield, 74 @ Taunton, 54 – Final – Mansfield opened the second half on an 11-0 run, turning a 37-26 lead into a 22-point advantage in the third quarter. Senior Tyler Boulter led the way with 22 points, including four three-pointers, seven rebounds, and three steals. Damani Scott added 13 points and six rebounds and Ryan Otto chipped in with 12 points for the Hornets, who had 10 players register points. Milford, 66 @ Stoughton, 69 – Final – Stoughton senior Cam Andrews connected on a three-pointer as the buzzer sounded to lift the Black Knights to a division win over the visiting Scarlet Hawks. Milford junior Cam Falcon hit a deep three to tie the game with under 30 seconds to play but Andrews, who scored a career-high 36 points, hit the last shot to earn the win. Attleboro, 58 @ King Philip, 53 – Final (OT) – Attleboro rallied from six points down in the final minute of the fourth quarter to force overtime and earn a sweep of the season series. Sam Pierce led the way with 21 points, while Nyah Thomas and Liv McCall each had 12 (including five in overtime). Faith Roy scored 15 for the Warriors and Julia Leroux added 12. North Attleboro, 52 @ Canton, 68 – Final – Hannah Jerrier had career nights in points, rebounds and charges taken to help Canton pull out an important victory to push the Bulldogs back above .500 and get within two wins of a tournament berth. Jerrier finished with 41 points and 25 rebounds while adding four assists, three steals and two charges taken. Erin Devine also had a double-double for Canton with 10 points and 14 boards and added six assists as well. Sharon, 30 @ Foxboro, 72 – Final – Ashley Sampson scored 20 points and Katelyn Mollica had 16 for the Warriors to keep the Davenport leaders unbeaten in league play. Franklin, 54 @ Oliver Ames, 61 – Final – Click here for a Recap and Photo Gallery from this game. Taunton, 29 @ Mansfield, 56 – Final – Mansfield broke the game open with a strong defensive second half, holding Taunton to just five points after going into the break tied at 24-24. Meg Hill continues to close in on 1,000 points for her career with 16 points and 13 rebounds, while Maggie Danehy also chipped in with a double-double of 12 points and 11 rebounds. Sydney Mulkern added nine points. Hannah Moniz paced the Tigers with 12 points and MacKenzie Handrahan had eight. Milford, 42 @ Stoughton, 47 – Final – Aliyah Wright scored 14 points to lead the Black Knights to a sixth straight win, helping Stoughton get back to .500 on the season and take over second place in the Davenport division. Lindsey McDonald added a season-high 12 points and 11 rebounds for Stoughton. Hockomock League Championships (@ Milford) – Click here for a photo gallery from this event. CANTON, Mass. – After leading by as much as 20 points, a second-half resurgence by Taunton saw Canton’s lead shrink to just six early in the fourth quarter. Taunton sophomore Dante Law (12 rebounds, three blocks) drained the Tigers’ only three of the game with five minutes left in the game, bringing the visitors within two possessions at 42-36. Coming out of a timeout, the Bulldogs decided to switch things up. After playing man-to-man defense for the majority of the game, the hosts switched to a 1-3-1 zone. The result was a scoreless stretch of over four minutes for Taunton, allowing Canton to regain its footing and get just enough separation for a 48-38 win. It marks Canton’s first win over Taunton since the Tigers joined the Hockomock League. Canton built a 14-4 lead after one quarter and took a commanding 30-11 lead into the locker room at the halftime break. But Taunton had its best quarter of the game in the third, putting up 14 points while holding the hosts to just seven points. The Tigers attacked the basket with purpose and got to the line nine times, sinking eight of those attempts. Taunton closed the third with a 10-2 run including a layup and two free throws from freshman Diamond Blakely (six points) and four free throws and a late layup from sophomore Naz Kenion (14 points). The Tigers continued that run into the fourth with a 9-5 run capped by Law’s three, prompting Canton’s defensive switch. Against the 1-3-1 zone, Taunton’s offense sputtered, going 0-for-5 from the floor with two turnovers. “It slowed us down and made us think,” said Taunton head coach Charlie Dacey. In the first half, the Tigers shot just 14% from the floor on 14 shot attempts while having 12 turnovers. “It stifles [the offense], it absolutely stifles it. That was a stifled, stagnant offense out there. It’s not like we haven’t worked on it, you have to slip the screens when they switch. We’ve worked on it, but we didn’t hit a slip screen all day long. For Canton, Tony Harris (11 points, 10 rebounds) hit a free throw, Jake Verille hit a free throw and Robbie Gallery converted a fast break with a minute left to help the Bulldogs pull away. Before that final stretch, junior Devin Foster (23 points) was responsible for keeping the Dogs ahead. He scored seven points in the opening quarter to help the hosts build a double-digit lead and scored eight more in the second period as Canton took a 30-11 lead into the half. He hit an early three in the third quarter, and had Canton’s first five points, including a traditional three-point play, of the fourth quarter. Canton boys basketball (8-2 Hockomock, 11-2 overall) will finish up its crossover games on Tuesday when the Bulldogs visit Oliver Ames at 6:30. Taunton (5-5, 9-6) will look to bounce back when it hosts Taunton on the same night at the same time.